All hail the pita! It holds pretty much anything you put in its roomy pockets, making it among the most capacious of breads. So if you’re going to make a pita sandwich, it better be fully loaded. 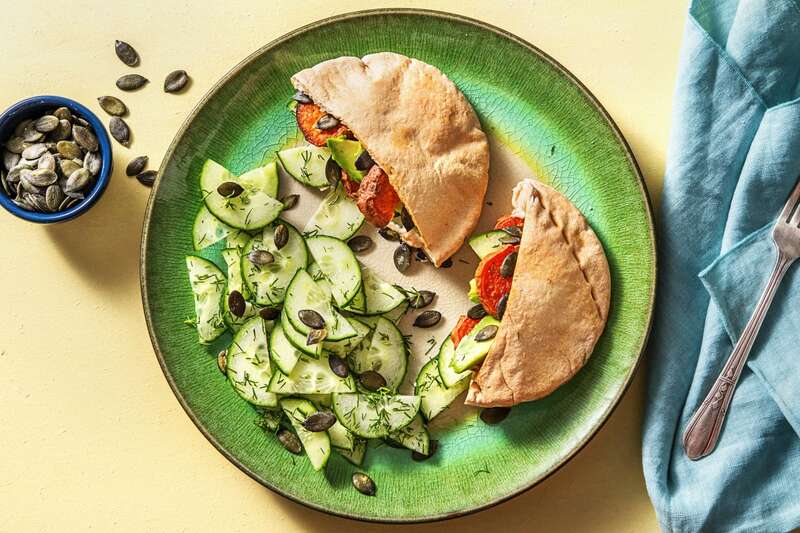 This one does not disappoint: in addition to rounds of roasted sweet potato, it’s packed with slices of creamy avocado, an herby cucumber salad, pumpkin seeds, and a spicy harissa mayo. Adjust rack to middle position and preheat oven to 450 degrees. Wash and dry all produce. 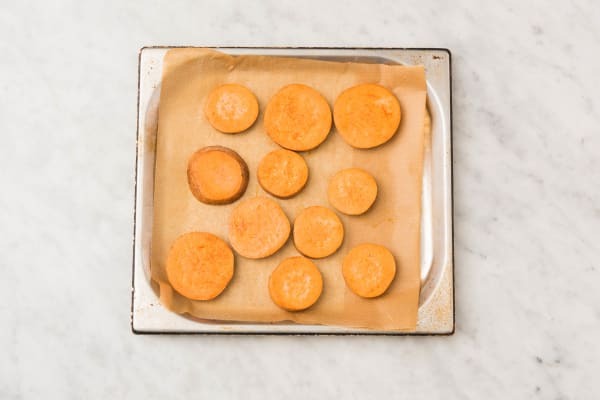 Slice sweet potatoes into ¼-inch-thick rounds. Toss on a baking sheet with a drizzle of olive oil, 1 tsp harissa powder (we’ll use more later), and a pinch of salt and pepper. Roast, flipping halfway through, until tender, about 20 minutes. Mince or grate 1 clove garlic (we sent more). 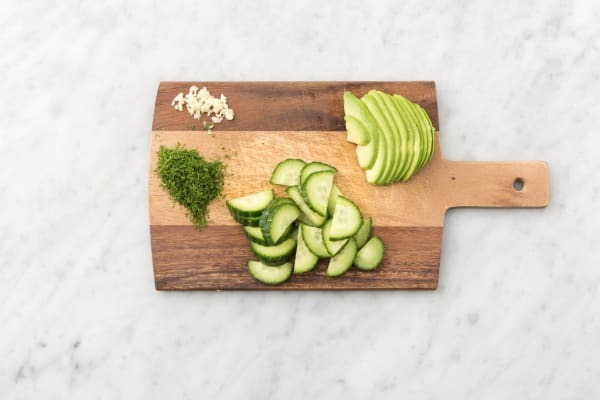 Halve cucumber lengthwise, then slice into thin half-moons. Pick and roughly chop enough fronds from dill to give you 2 tsp. Halve, pit, and peel avocado, then thinly slice. In a small bowl, combine 3 TBSP mayonnaise (we sent more), a pinch of garlic, and a pinch of harissa powder. Give mixture a taste and add more garlic and harissa powder as desired. Season with salt and pepper. 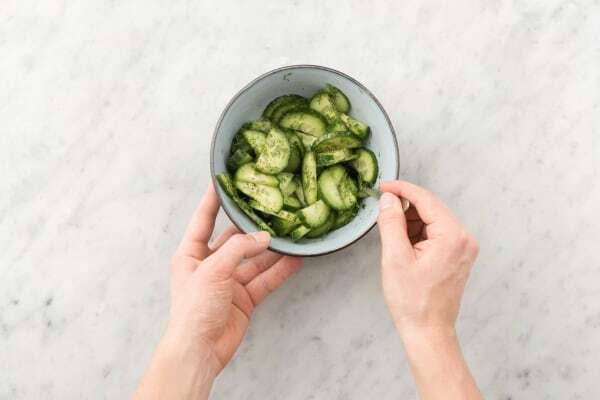 In a medium bowl, toss cucumber, chopped dill, vinegar, a drizzle of olive oil, and a pinch of salt and pepper. 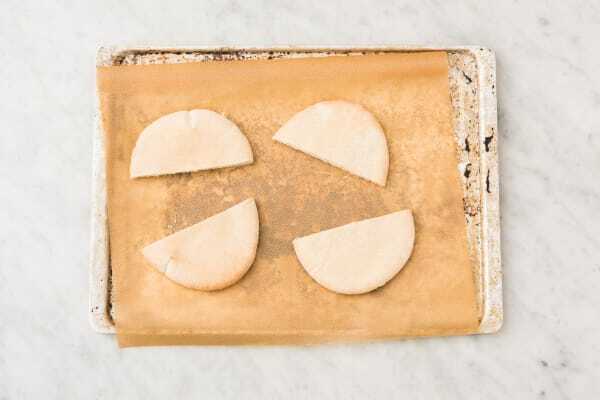 Cut pitas in half to create four pockets and place on another baking sheet. When sweet potatoes are almost done, after 18-20 minutes of roasting, put pitas in oven. Toast until warmed through, 2-3 minutes (they should still be soft and flexible). TIP: If there’s room, you can place pitas on the same baking sheet as sweet potatoes instead. 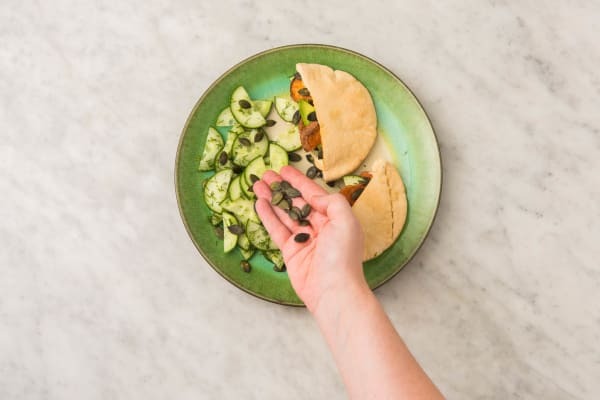 Spread harissa mayo inside each pita half, then fill with sweet potatoes, avocado, a few pepitas, and a small amount of cucumber salad. Divide stuffed pitas between plates. Add remaining cucumber salad to the side and sprinkle with remaining pepitas.